BikeCommuters.com was created by RL Policar and Moises (Moe) Ramirez in Spring 2007. Both RL and Moe were avid commuters and had broken off from another website to start their own mountain biking blog. However, bicycle industry leaders from all over the United States asked them to create a bike commuting website since their style of writing/blogging was unique from any other out there. Not long after the site launch, BikeCommuters.com’s readership grew at an astounding rate. With that in mind, RL and Moe sought the help of a man who is a legend in his own right, Jack “Ghost Rider” Sweeney of Tampa Bay, FL. Together, the trio has been an unstoppable force in the bike commuting world. BikeCommuters.com provides news, articles, product reviews, and how to’s of anything that is related to bike commuting. Readers can enjoy an up to date selection of information that will help commuters from the grocery getting person to the guy that has a 60 mile commute. For Advertising Inquiries or Press Relations, please contact us on our Facebook page at https://www.facebook.com/BikeCommuters/! 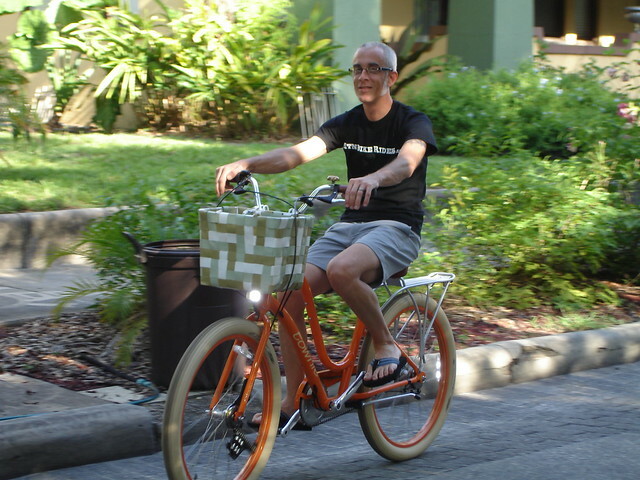 My name is RL Policar, Co-Founder of BikeCommuters.com. I am a Bike Commuter and a MtnBikeRider. 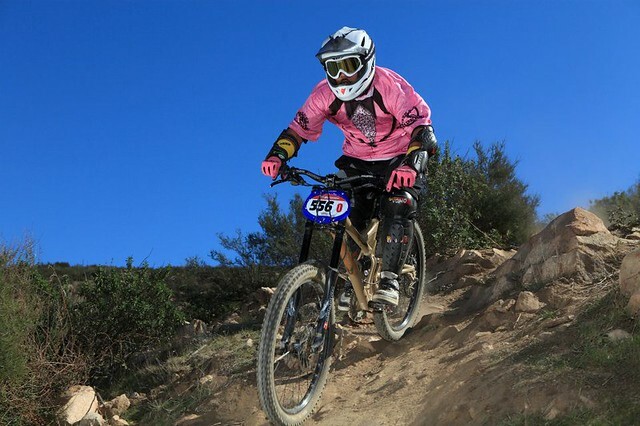 If I am not on my commuter bikes, I can usually be found racing my downhill bike. Bike Commuting helps me stay in shape for the racing season. I make an effort to be on my bike as much as I can. I’m a reference librarian who, after 20 years in the Florida sun, moved to the rolling hills of the midwest and is learning first-hand what it is like to commute in wintry weather. I commute because I love to ride my bikes, because I live close enough to where I work to make it feasible, and I don’t have to pay for parking, gas and all that other stuff that goes with being a car driver. My current commute is 6 miles each way, for an easy 12 mile round trip. Sometimes if I have a little extra time, I will do some neighborhood exploring on my way to work, adding a couple or three miles to the mix. Hi, Miriam Gee (a.k.a. Mir.I.Am) here. I have been a bike lover and commuter since 2005. 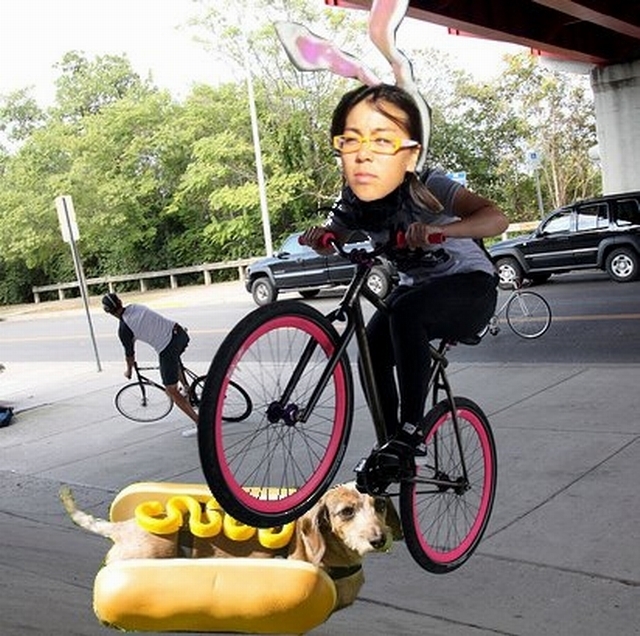 After responding to a BikeCommuters “call to arms” for commuter profiles and guest articles, I auditioned to join up as staff writer with the “Young Woman Bunny-Hop of Hot Dog” portrait in 2011. I have an affinity for bikes of all shapes and sizes, ninjas, tanks of bullfrogs, and blinky lights. In the beginning, one might even say my passion for bicycles ignited upon the discovery that bicycles serve as a means to mount blinky lights!! I have commuted in San Luis Obispo, Seattle, and currently bike and interweb-scribe from Honolulu, HI. I have three bike step-children, a Scott Speedster roadie, $20 office junker BMX, and a hand-me-down women’s 1976 Schwinn LeTour II. 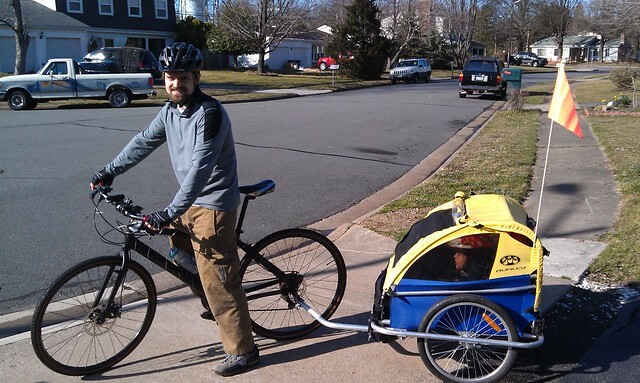 I’ve been bike commuting at least part-time since 2007, and switched over to most-of-the-time in 2008 when my wife and I decided to become a one-car family. I’ve always biked when I could though – I biked to middle school and high school a lot, and didn’t own a car during college. Men – Lose 5 lbs. in you first week* with Fast 5 plus FREE SHAKES!